What we didn’t bargain for this time around was an overturned tanker truck in the pre-dawn hours of the the foggy, drizzly morning, happening at a crucial point near the foot of the Atchafalaya Basin Bridge and blocking our route home. The closure and cleanup had been underway for going on 4 hours when I decided that we couldn’t just hang around eating fast food chicken biscuits on the east side of the river forever, so we made the long slog across the bridge to the other side of the Mississippi and took the official detour that had been set up to get around the accident, Highway190 West. In a way, this was fine, since it’s always fun to see what I’m missing on my regular route. But it did take us out of our way. We drove through Krotz Springs and then Opelousas, heading south to Lafayette and back to Interstate 10, where I could have picked back up with my usual route and hightailed it for the Texas border. But I had to stick to my original plan, the one I had made before we even left Houston, which involved heading south from Lafayette to the unincorporated community of Broussard. 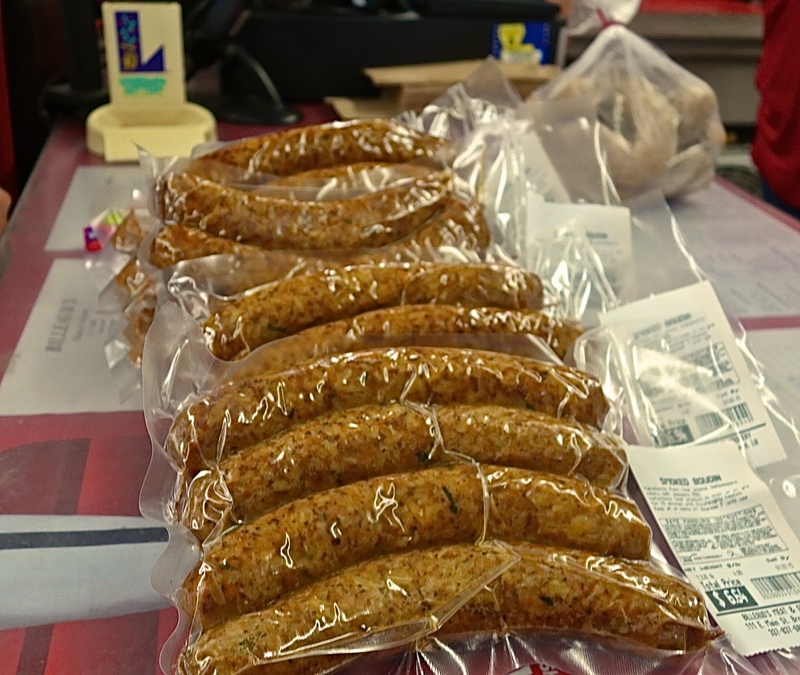 There’s a little Shell station on East Main Street, and in the back of the convenience store is a meat market that makes some of the best boudin anywhere. Though I’ve eaten boudin all my life and have lived in a few towns around here, it was Calvin Trillin who made me realize what I was missing each time I drove I-10 from Houston to Baton Rouge. One of his pithiest essays is written in praise of the wonders of of southwest Louisiana boudin. I like to think of Trillin as the first food blogger, just without the Internet or anything. If this seems impossible, read some of his work, and you’ll understand. 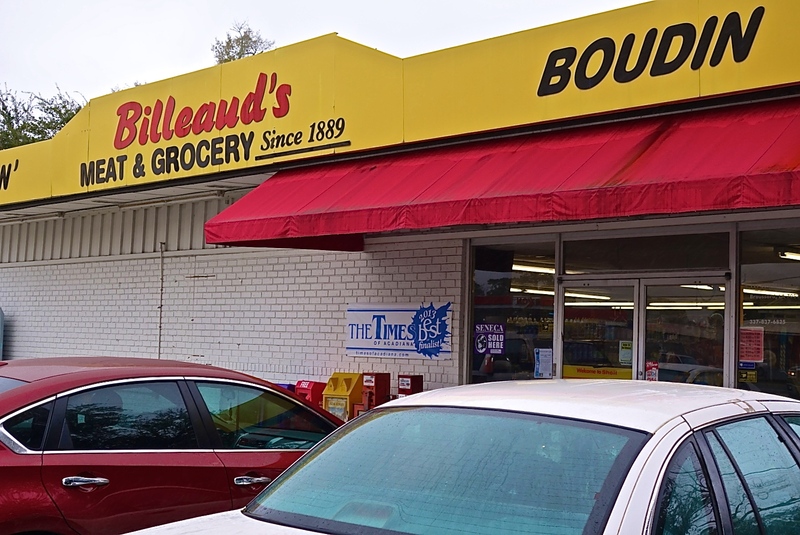 I’m always excited when we make plans to stop at Billeaud’s Grocery. It’s a 10-mile detour from I-10, and worth every minute of backtracking. To my kids’ utter mortification, I snapped a few pictures for the blog on the way across the misty parking lot. As we reached the entrance, a crinkled little lady in a purple crocheted cap was walking out. ”Y’all travelin’, aren’t y’all,” she said, more of a statement than a question. “Yes ma’am,” I sheepishly replied, and I thanked her for holding the door as my kids slithered through like they’d never laid eyes on me before. It does feel weird taking pictures at Billeaud’s. There’s no showiness, no pretense here. This area has always been ground zero for great regional cooking. Some of the best places out this way do not have a billboard on the Interstate. They just keep on making those links, and there’s a line of locals every day. At the counter in the back of the store, a moment of panic ensued when my first scan of the meat case yielded NO BOUDIN. It was easy to see that the pickings were a lot slimmer than usual. 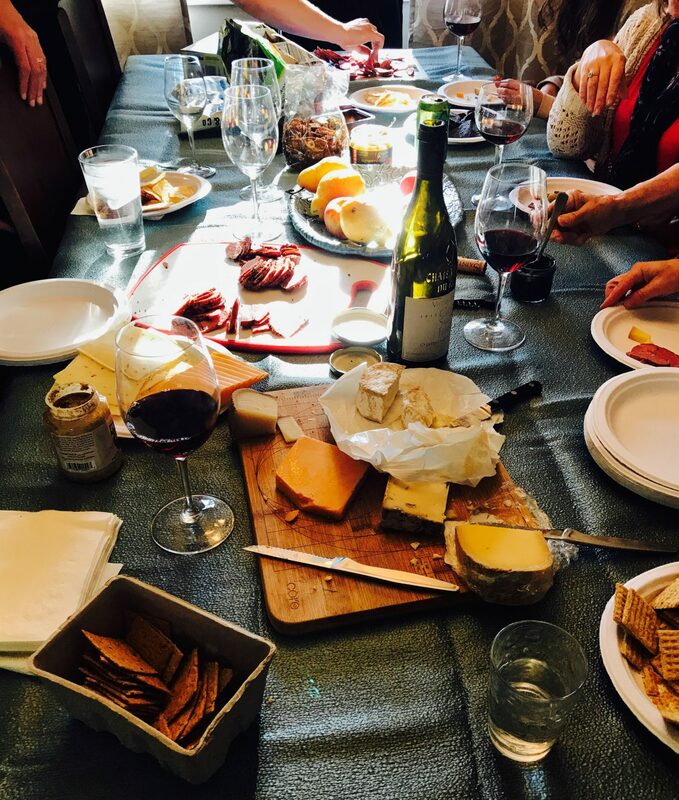 Of course, I should have been prepared for this–when you’re making a big boudin run between Christmas and New Year’s Eve you could come up empty-handed, since boudin is the perfect party food. There were beef and pork sausages, pork roasts, cracklings and other delicacies, but those were not what I had journeyed here to buy. Eventually I came across 5 shrink-wrapped packs of smoked boudin, the only ones left in the case. I scooped them up quickly, along with the last bag of regular links. These were packaged in a twist-tied plastic bag, all coiled together like a sack of napping snakes. 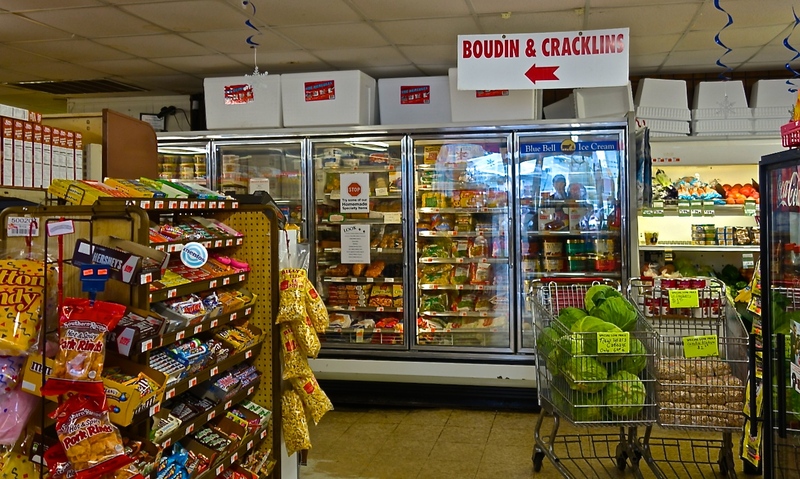 To my further delight, there were even a couple of packs of crawfish boudin, so I took those too, staring straight ahead as I headed to the checkout counter, so as not to receive the evil eye from any other boudin customers. (When you only have a few chances a year to buy good boudin you can get a little greedy. Hopefully a new batch was on its way to the case.) Back in the parking lot, I gleefully arranged my numerous packages in our styrofoam cooler. Then we took off into the mist toward Lake Charles and on to Texas. With the extra-long backup at the Mississippi River Bridge, the Highway 190 detour, and the stop for boudin, our usual five-hour drive had grown to just under seven. No matter. I got what I came for, and the kids were fairly patient along the way, since I wasn’t taking any more pictures at gas stations. Back at home in Texas, I tossed the load into the freezer to savor over the coming months, keeping back one pack of the smoked for all of us to sample immediately. 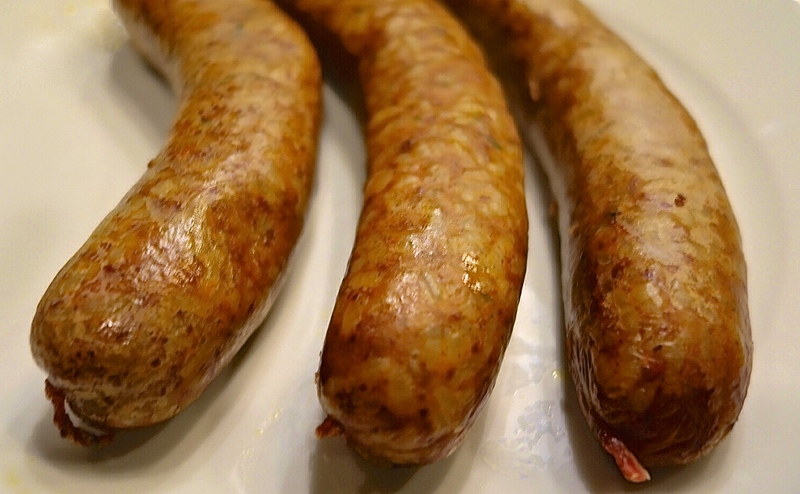 You can pan steam your boudin using just a bit of water, or you can warm it gently on your grill over low heat. Grilling is great, especially for regular boudin, because it crisps up the casing a bit and adds another delicious component to the flavor. Remove the boudin from the wrapper and place the desired number of links on a plate. Layer together about four or five paper towels. Drench the paper towels under the kitchen faucet. Form them into a loose ball between your hands and barely squeeze them—just enough to keep the wet paper towels from dripping down your arms. Re-open the ball and lay this wet blanket on top of the boudin, loosely tucking the “blanket” under the boudin all along the perimeter of the links. Microwave the boudin on full power, about 3 minutes at a time, until the links are hot and steamy all the way through. Let the wrapped links cool for a minute, then discard the paper towels. Allow the boudin sit for another minute, so that the rice and meat can regain their “composure” after all that steaming. Then you’ll be able to easily snip the links into bite-sized pieces using a pair of sharp kitchen shears. Billeaud’s smoked boudin contains a fairly equal ratio of rice to meat. The rice is cooked well, a mixture of intact grains and softer ones that have begun to meld with the finely ground pork, pork liver and a smattering of green onion. 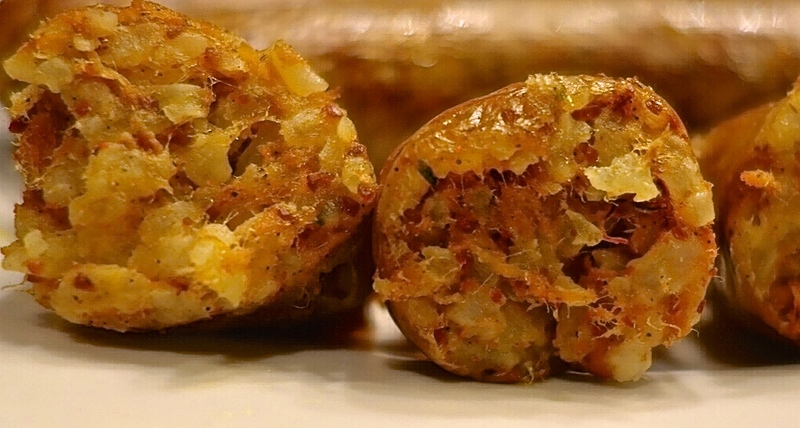 The links have a great flavor and texture–not too greasy, not too mushy, well-seasoned, with a bit of heat, though not overwhelming to the beginning boudin eater. I can confirm, Billeaud’s boudin rocks! 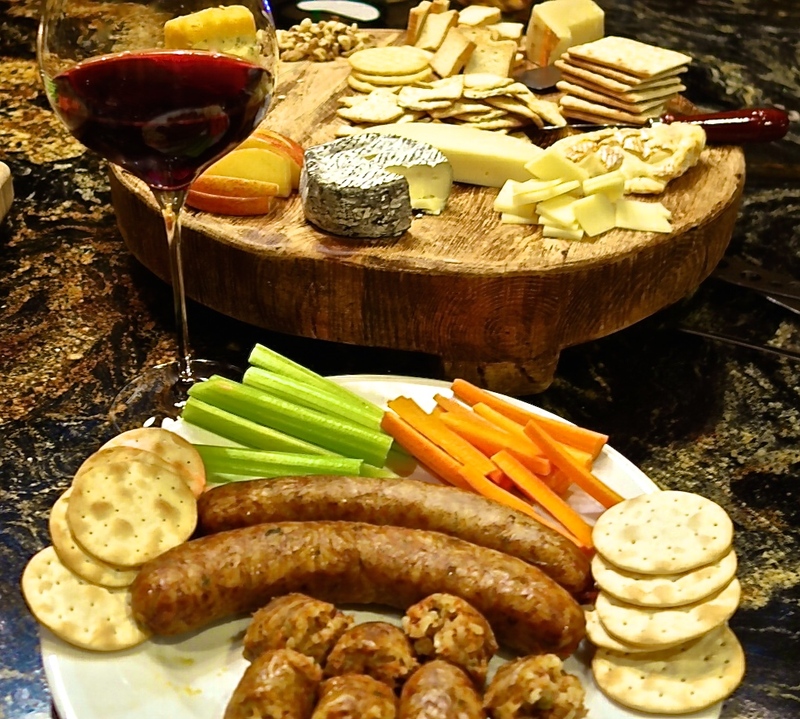 We stopped on the way to my cousin’s crawfish boil to puck up some boudin as an appetizer….C’est Bon! I’m going to try Kartchner’s in Krotz Springs next trip. Would love to get your opinion, if you’ve been there!